Quick Overview: Lens Gasket is a line contact seal for use in high pressure piping systems and in pressure vessel heads. The lens cross section is a spherical gasket surface and requires special machining on the flanges. Since the contact area is very small and gasket seating pressures are very high, the gaskets will seat with a small bolt load. 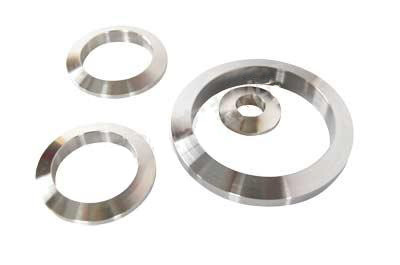 RGS Lens ring joint gasket manufactured in accordance with DIN 2696, provide the engineer with a high integrity, high pressure and temperature seal for special applications. Lens rings have a spherical surface and are suitable for use with conical flange faces. So other styles are available on request. * Lens ring joint used in higher pressure then 3,000 lbs. * These gaskets had been used on pipe flanges in synthesizing line. As with all metallic joints, the re-use of lens rings is not recommended.